The Intensity Frontier: Search for rare new phenomena or difficult-to-produce new particles using medium-energy ultra-high-collision-rate accelerators, or some other low-energy ultra-high-rate mechanism. 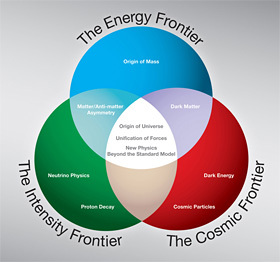 Each frontier has its advantages; the energy frontier probes new particles and forces very directly, allowing for detailed study, whereas the intensity frontier is indirectly sensitive to much higher energies and/or much weaker forces, though it often provides fewer details. Meanwhile, at the cosmic frontier we rely purely upon what the universe has to offer, which has the obvious benefit that what the universe provides comes for free, and the disadvantage that what it provides is limited and out of our control. A popular illustration of the three frontiers of particle physics and their overlapping goals. I should note that these three frontiers often work in concert; many important questions can be addressed by two or all three frontiers. A classic example is dark matter: we can hope to make dark matter particles ourselves at the Large Hadron Collider [LHC] (the energy frontier), detect their astrophysical and cosmological effects through various observations of the universe (the cosmic frontier), use giant detectors to observe a dark matter particle in the rare case that it hits something as it passes through (at the boundary between the cosmic and intensity frontiers), or produce them or their relatives in extremely high-intensity lower-energy particle accelerators (the intensity frontier.) If dark matter particles are discovered, a full understanding of their properties will require exploring them using all of these methods. Another very important general situation that could occur is that the LHC might make a discovery, such as of an exotic type of Higgs particle, but its data might be insufficient for a complete interpretation of its meaning. Experiments at the intensity frontier, making precise measurements, could easily be critical in distinguishing different possible interpretations. This kind of complementarity among different methods was important historically in the process by which the current Standard Model of particle physics was developed. This entry was posted in Particle Physics. Bookmark the permalink. And congrats to you for been part of such monumental effort!